during our week of weather exploration, tornado safety talking, moving like the wind, seeing the wind on bubbles and fabric, we also did some spin art. 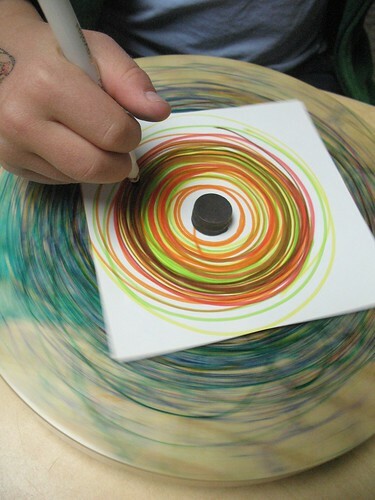 it’s such a simple tool: wood on a turntable with a magnet in the center to hold paper on with another magnet. thanks to my folks to this donation. 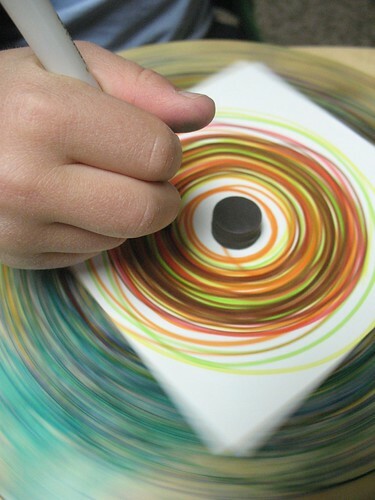 oh, dear spin art you have filled many papers and corners of free wall space. EDITED: i wish i had my camera at school today…the day after this post. it was quieter suddenly and i found three kids standing on chairs peering over my office half-door…eliza was in there watching dora on my computer and they could just see the edge of the show. i need to get that screen out of there too.